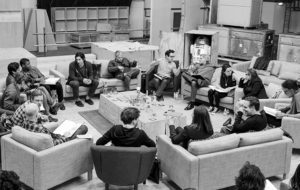 The cast of Star Wars Episode VII gets together for a table read. Rumors have been flying for months, and finally, FINALLY, we have a cast list for Star Wars: Episode VII. Which is good because they start filming next week. Director J.J. Abrams says, ‘We are so excited to finally share the cast of Star Wars: Episode VII. It is both thrilling and surreal to watch the beloved original cast and these brilliant new performers come together to bring this world to life, once again. We start shooting in a couple of weeks, and everyone is doing their best to make the fans proud. We knew most of that. Adam Driver was confirmed months ago, and John Boyega (yay!) has been rumored for some time. And though it wasn’t official from Lucasfilm or Disney, the return of the original cast members was a not at all kept secret. The real surprise comes in the form of Andy Serkis (!) and Domhall Gleeson, as well as newcomer Daisy Ridley, and Oscar Isaac (who had only just been associated with the film this morning). Of course, beyond the obvious returning stars reprising their roles, there’s no information on who these actors will play. Driver is rumored to be playing a baddie, and we can only hope that Serkis will be seen, rather than just being in a greensuit again (though that’s likely because well, Star Wars). But whoever they are, we’re a bit more excited than we thought we’d be. Star Wars: Episode VII is still untitled, but is due in theatres in December of 2015.